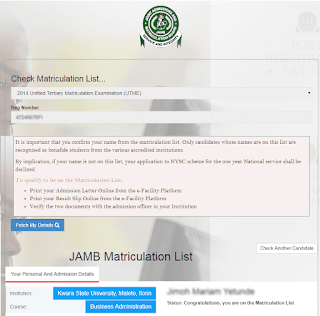 what is jamb matriculation all about and what to do if your name is not on the jamb matriculation list for nysc mobilization or direct entry, how to print your admission letter and result slip online. 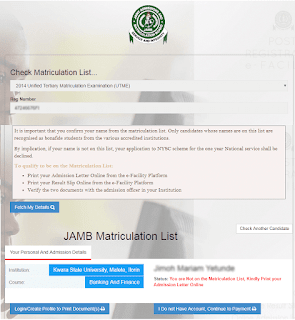 What Is JAMB Matriculation List All About. It is a list that contain all the names of all bonafide candidates from accredited institution, that are eligible to be enlisted for the one year National Youth Service Corps NYSC. If a candiate name is not found on the list, such a candidate can not be able to apply for the one year national services on the nysc registration portal. It is important to confirm that your name is on the matriculation list, if you wish to apply for the online nysc mobilization exercise. Answer: for the now, it has no closing date, it is a continuous process. 1. 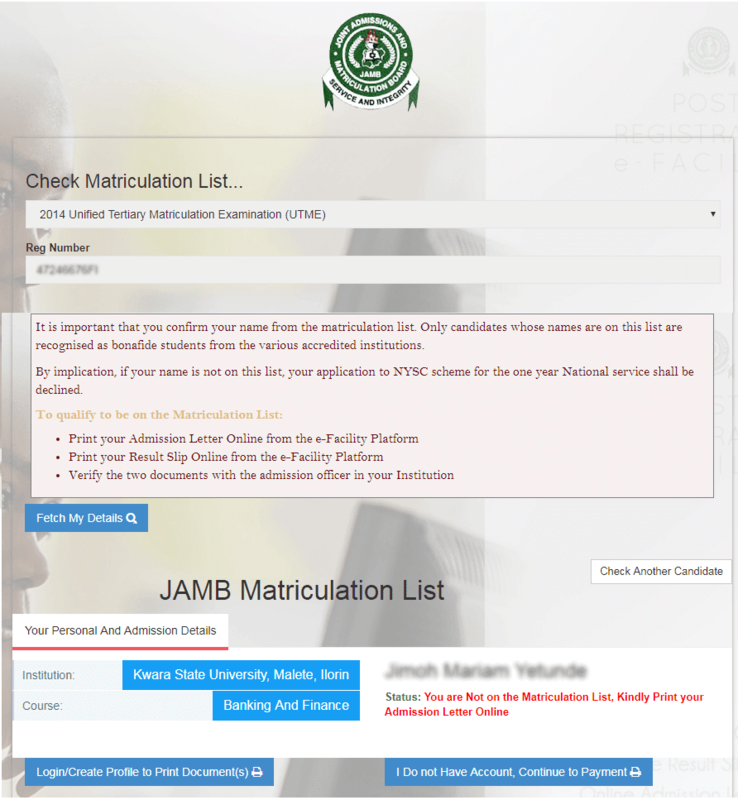 Vist the Jamb Matriculation List website for nysc mobilization or direct entry. 2. Select the given year of your jamb registration number by click on the option Select Examination..
3. Type in your UTME Registration Number. This is made up of 8 digits and 2 Alphabet at the ending. 4. Scroll down and click on the button Fetch My Details. 1. First your must have been offered admission from JAMB. To be able to print out your document (Jamb admission Letter and Original Result Slip) for NYSC Mobilization the first basic step is to create a jamb profile. How to Create Profile for Jamb Matriculation List nysc mobilization. 1. visit the jamb profile registration page, using either your desktop devcies or mobile browser. 2. Click on Create an account button. 3. Enter A functional email address and other details as the page opens up, click on verify email. 4. Login into your email account to retrieve a confirmation code, take note it could be in your spam folder if not seen on your inbox. 5. Then click on the link send to you by JAMB to continue your registration. 6. Enter your name, surname, email, date of birthday, password, etc. 7. Lastly click on “Sign Up” to complete the creation of your account. Note: The step stated above for the creation of profile does no longer work anymore when you login after creation of the profile. Visiting the nearest cbt centre, or you can can reach me on mobile/whatsapp 08051311885 to enable me speed track the creation of our profile that will give your access to print out those documents that qualify one to be on the matriculation list for nysc mobilization. 1. Visit the jamb efacility website for result slip and admission letter printing . 2. Type in your jamb username and password. 5. To Print Jamb Result Slip, Click on the link Print Result Slip to make payment to generate remita rrr code and make payment online or through bank. After successful payment continue from step 6. 6. Select the given year you intend to print. 7. Type in your UTME Registration number. 8. Click on the button Print Admission Letter or Result Slip, to download and make a print out, after print out into hard copy, make extra photocopy of it. 9. To send admission letter or result slip to your email, click on send to the email, it will be send to the email address you used to sign into your jamb direct entry profile.